Markham, Ontario is a small town north of Toronto that has a historic main street which is often used in period films and television shows. Flash of Genius Hollywood movie used the whole street made over as 1960’s Detroit backdrop, and Sullivan Entertainment’s Wind at my Back established many character’s homes on the street in their TV series set in the 1930s. Location managers will tell you that Markham is actually looking more historic today with newly constructed brick buildings and townhouses built to match neighbouring heritage buildings. So its the perfect setting for a temporally transcending Holiday party! 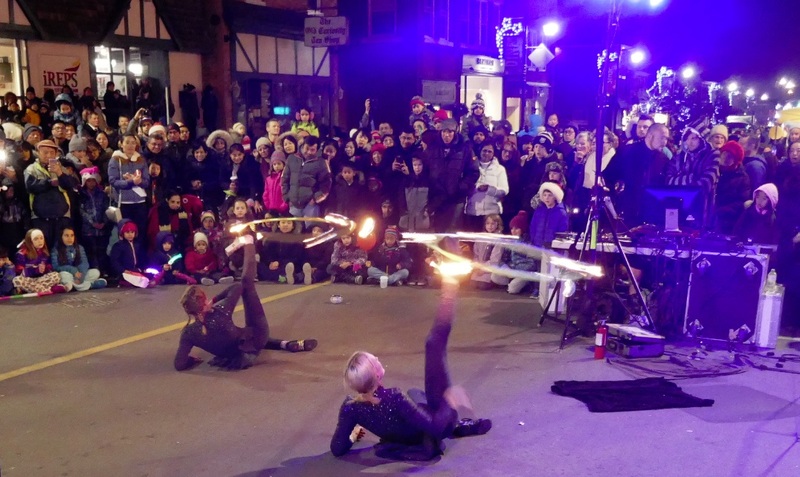 Every holiday season for decades the retailers all along Markham’s historic main street get together and host a party called the Festival of Lights. 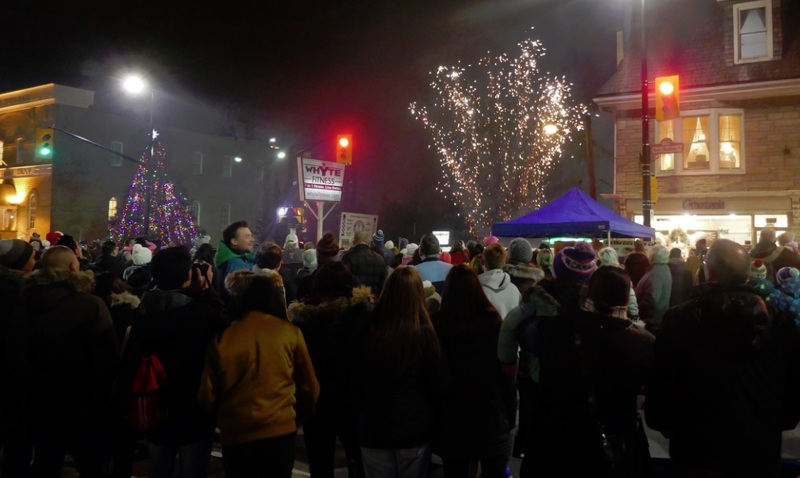 They’ve done this for over thirty years now, and judging by the size of the crowds that came out last weekend, the tradition has the momentum to continue for another three decades. The event went from 6pm-10pm and Isabelle Hoops Entertainment team did double duty. We gave them both fire and ice, but in the opposite order. First we appeared as friendly snowflakes and then we returned after the fireworks with our own pyrotechnics, the Northfire Fire Show. 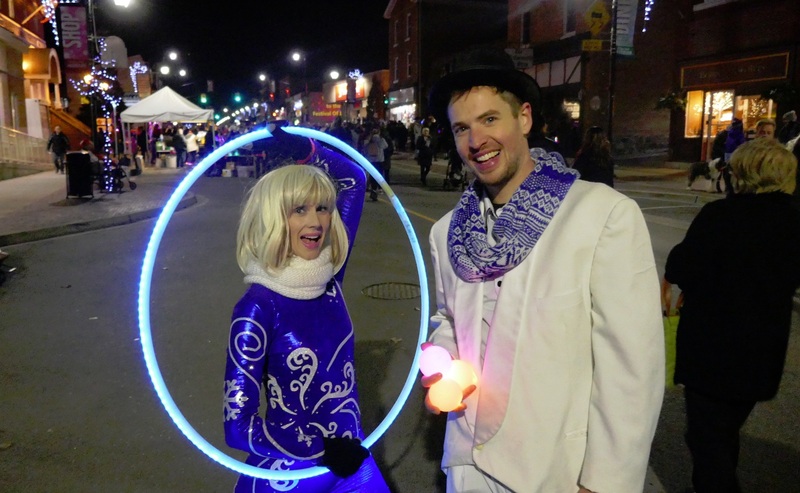 For the better part of an hour, our performers Jack Frost, Bella Snow and myself as the Snowflake Kid sauntered about the festival doing our routines. I like to keep the hula hoop moving and only stop my sideshow to focus attention on other staff members when they’re doing their solos. The photographer snapped this picture which he used on Twitter to promote the story and there is something magical about this image. I love the expressions on the faces of the people watching, young and old, they are enthralled. 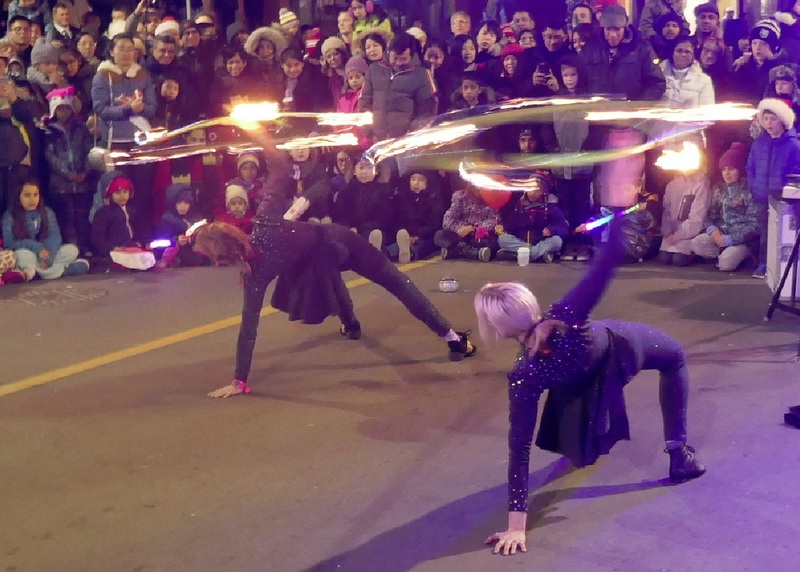 Performing and being truly entertaining as a street acrobatic is much more than flawlessly executing stunts and demonstrating balance, agility, and motor coordination. It’s about connecting with the audience and communicating something, however brief, that they can digest in their minds for the rest of the evening. The very best performances make memories that spectators cherish for the rest of the lives. And that’s just what happened in the second half of the night, the ‘fire’ part of the evening. 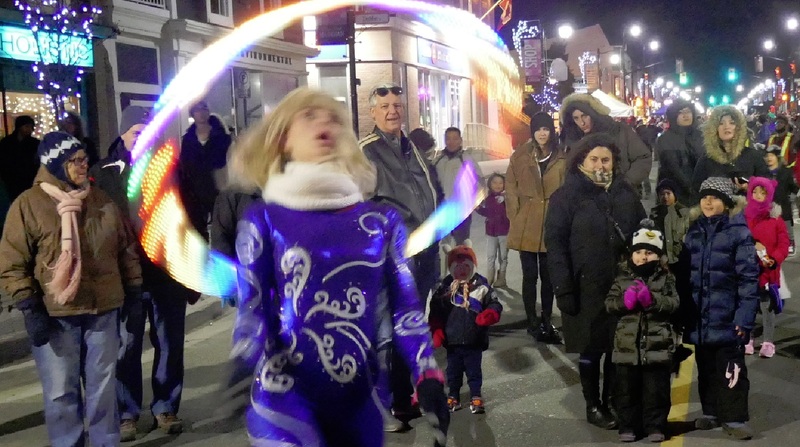 Isabella Hoop’s NorthFIRE fire show was proceeded by actual fireworks. 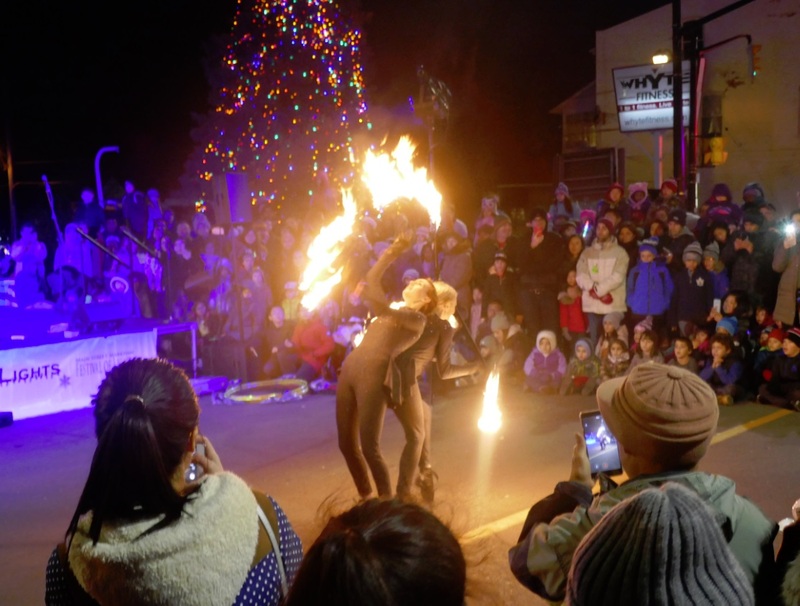 Our Fire Show happened right beside the Christmas Tree, which Santa had only just lit up twenty minutes earlier, and the gunpowder smell from the municipal fireworks show still hung in the air. So the stage was set for a wonderful performance, or rather the street was made ready. Kalen Jackson as Pyromeo had to artfully move the masses back to make enough room and our small circle kept getting tighter and tighter as more festival attendees joined the throng. 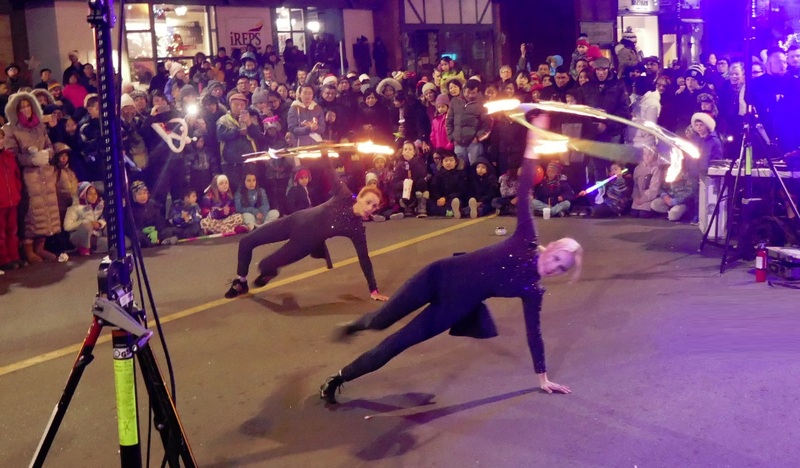 Young people lined the circle, sitting right on the street to watch our performance, and so they were in perfect position to experience the sights, sound and smell of the Fire Show, which is something they won’t soon forget. 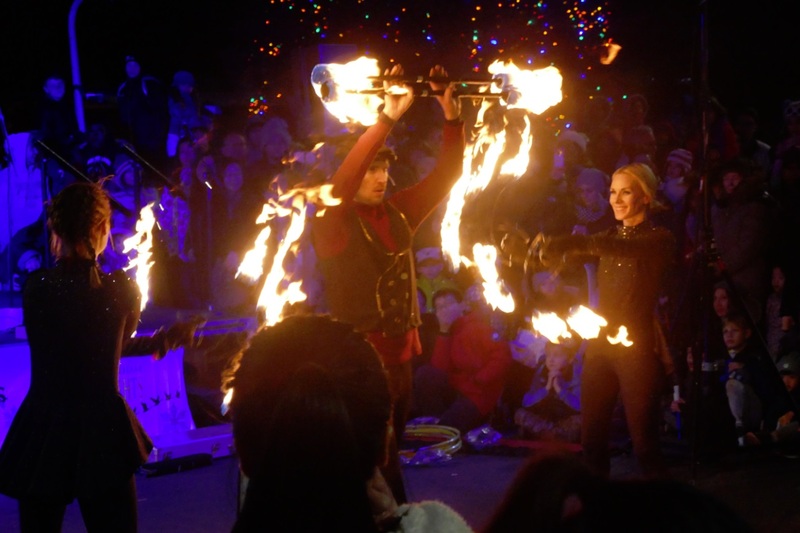 The show started when Kalen, dressed in his signature red and black Pyromeo costume cajoled the crowd and amused them with his fire statues and fire balancing acts which in truth are very easy for him, and his genius is to make it look hard. Then myself and Darling Pink came out with fire hoops and the music was perfectly timed to ‘break’ into a groovy beat as we started spinning, cascading flames in a melody punctuated by Pyromeo’s fire balls which can rise fifteen feet up in the air. 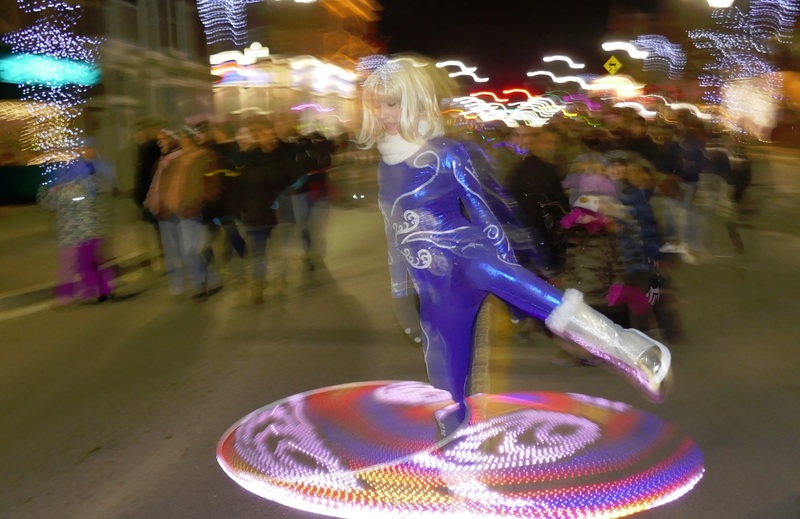 These bursts of flame always shock and amaze the crowd, and they gasp audibly and the combination inevitably brings more spectators pushing closer, shrinking the circle. Near the end of the show, it was downright intimate. After such a spectacle its common to have mothers and educators approach and ask about school programs. This is something we offer! 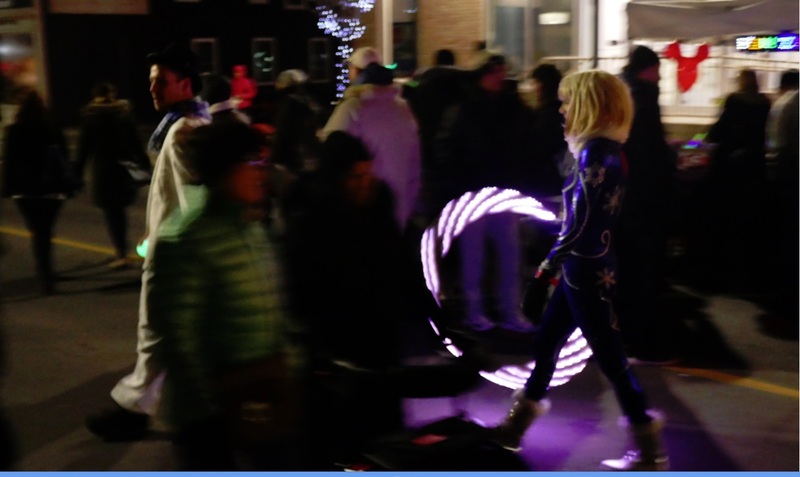 More information about hula hoop training (minus the flaming tips) and hooping fitness programs can be found here on our website.